for the definition of a function. The best I managed to do with tikz and align is very poor. I'm a beginner with Latex, hence I apologize in advance in case the question had a trivial answer. Welcome to TeX.SE! If you want just this alignment, you only need an array. Not the answer you're looking for? Browse other questions tagged diagrams alignment or ask your own question. Molecular orbital diagrams in LaTeX? 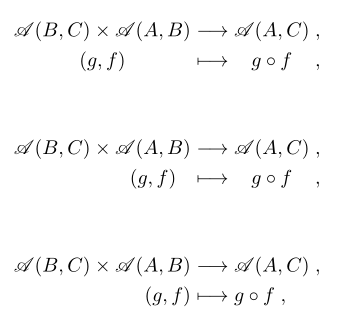 How can I draw this commutative diagram for function composition? How to reproduce this epsilon delta definition diagram with TikZ? How to display a bifurcated function definition in exam class? How to draw a region of non-uniform electric field in TikZ?